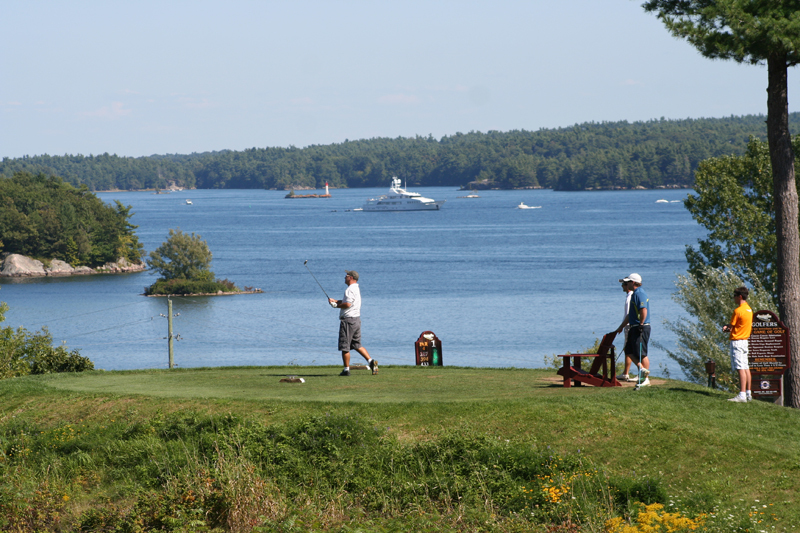 Glen House Resort, Gananoque One of Eastern Ontario's most demanding and picturesque courses is found at this historic 75-room inn on the banks of the St. Lawrence River, in the heart of the Thousands Islands. 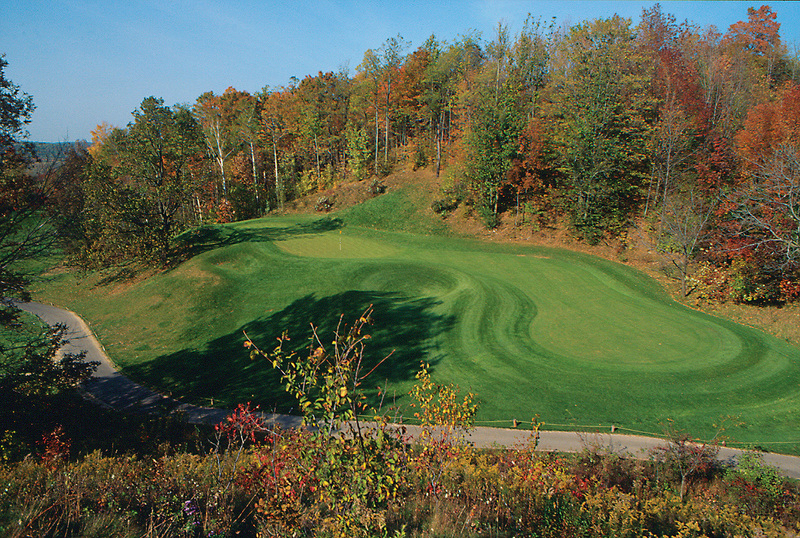 From the nerve-rattling opening tee shot over a deep gorge, Smuggler's Glen Course treats golfers to spectacular river views and a roller-coaster thrill ride through a Canadian Shield landscape of high granite cliffs and rolling pine-covered hills and valleys. 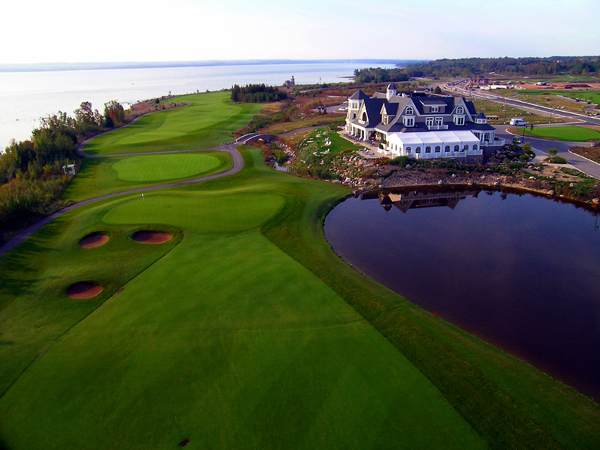 The Briars Resort and Spa, Jacksons Point With nine holes designed by legendary golf architect Stanley Thompson, and nine by his lone-time associate Robbie Robinson, The Briars Golf Course boasts one of the most enviable pedigrees in Canadian golf. The subtle 6,285 yard layout near the banks of Lake Simcoe rolls gracefully through mature stands of birch and evergreens, while offering vistas of the Black River. The resort itself is build around an antiques-filled Regency manor house dating from the 1840’s. Cobble Beach Golf Resort, Owen Sound Doug Carrick’s acclaimed Cobble Beach Golf Links is the centerpiece of a master-planned golf community on the southern shore of Georgian Bay near Owen Sound. From the Nantucket-style clubhouse, which includes a 10-room inn (there are also five new guest cottages), golfers set forth to play a links-style course that offers gorgeous views of the bay with almost every shot. And like all great courses, this one ends with a wallop on the 18th hole, a par five that rolls along dramatic cliff-top bluffs. Pinestone Resort, Haliburton A sky-high slope rating of 141 has earned Pinestone’s golf course a reputation as one of the most challenging in cottage country. 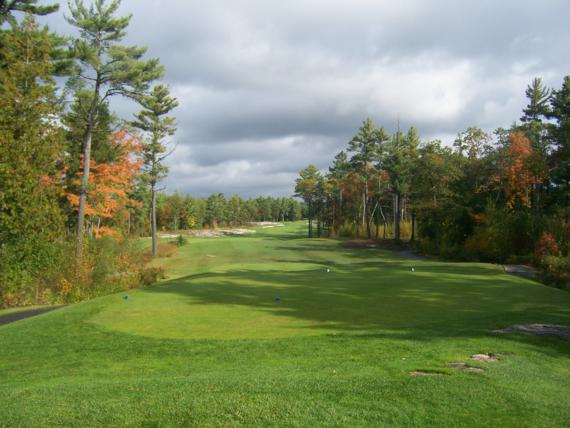 Though just 6,024 yards long, architect Jack Davison’s layout deep in the Haliburton Highlands features tight fairways, treacherous multi-level greens and numerous water hazards. After golf, explore kilometres of marked wilderness trails at a country-style resort that offers accommodations in 103 guest rooms, villas and chalets. 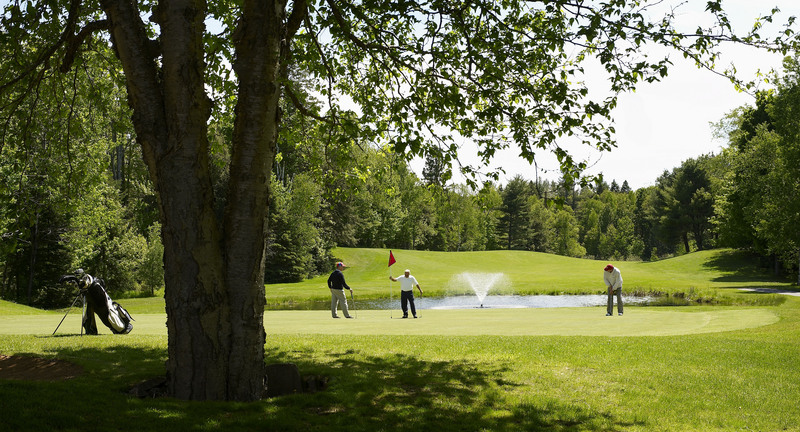 Hockley Valley Resort, Orangeville This intimate and popular family-run resort, which offers 14 downhill ski runs in winter, is home to a gorgeous links-style course by Tom McBroom routed through the dramatic and heavily wooded Hockley Hills. Following the natural contours of the land, McBroom's layout climbs about 90 metres and then plunges as much within a span of several holes. On a clear day, eagle-eyed golfers can see as far north as Lake Huron's Georgian Bay. Rocky Crest Golf Resort, MacTier A popular cottage country getaway offering spacious suites and a variety of sporting activities on Lake Joseph, Rocky Crest caught the attentions of the golf world with the 2000 opening of a Tom McBroom-designed course that surely numbers among the most scenic in Canada. McBroom carved his fairways through a thrilling mix of forest and wetlands, brilliantly using the granite outcroppings of the Canadian Shield to shape and accent golf holes the same way that Arizona's desert courses are framed by cacti and sand. Horseshoe Resort, Barrie Adrenaline junkies flock to this popular ski resort during the summer to mountain bike, take a Hummer tour, and zip-trek through the treetops. A more sedate-though no less satisfying challenge is offered by Horseshoe's two excellent Rene Muylaert-designed golf courses. The Valley course starts at the base of the hill and ends with a panoramic view of the valley from the 18th tee while the wider fairways of the Highlands course are slightly more forgiving. 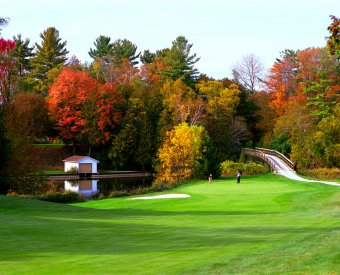 Deerhurst Resort, Huntsville Muskoka's golf boom began with the 1990 opening of Deerhurst Highlands Golf Course, an outstanding Top McBroom-Robert Cupp co-design on the grounds of a sprawling lakeside resort capable of accommodating more than 1,000 guests. 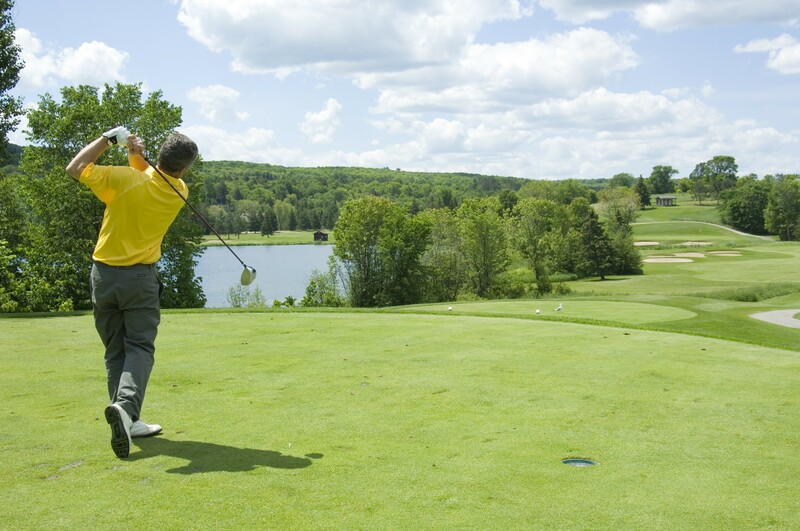 Starting with a awe-inspiring view of the surrounding countryside from the elevate first tee, Deerhurst Highlands leads golfers on a thrilling ramble through forest and wetlands, and past immense walls of Canadian Shield granite. Also offered at Deerhurst Lakeside, and executive course renowned for its lovely views of Peninsula Lake.